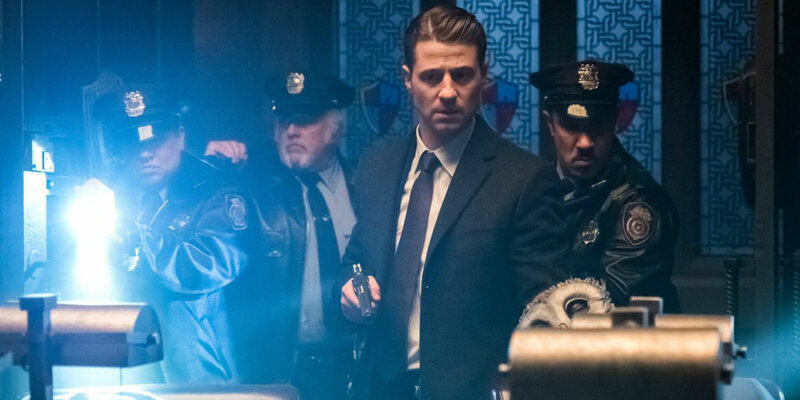 Just as Gordon (Ben McKenzie) and company were closing in on the Court of Owls -- who, by the way, suffered a swift demise at the hands of the mysterious overseers fans know is clearly the League of Shadows/Assassins -- the GCPD finds itself thrown off course by a wild card. This time, it was a Tetch-enhanced Lee who invaded the station, having buried Gordon alive in a trap designed to get him to inject himself with the virus. As we suspected, Baccarin savors the chance to play the villain for a change, and really, her part of the Gordon/GCPD branch of this episode was its saving grace. Even though her plan still revolves around the tired notion of Gordon's "dark side" (really, Gotham? ), dark Lee's playful attitude brought a flair to this week's episode. While it's easy to pinpoint the show's regular dose of plot holes (how does Lee know that dark Gordon will be gifted the super strength to bust out of his coffin in time? ), Gotham's showrunners seem to have recognized that the show works best when it is completely off the rails. Any semblance of the grounded crime drama the show started off as is long gone. 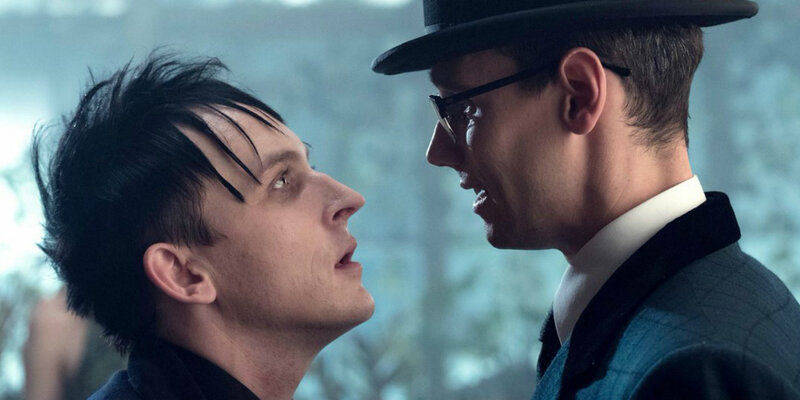 This Gotham has no qualms with embracing its ridiculousness, and it's a far more entertaining show to watch because of that fact. Most other shows would have shied away from letting Gordon inject himself with the Tetch virus, but if this development finally gets us past his "inner darkness" arc, it's a price we're willing to play. Moreover, it's a bold move for the show, though it does essentially confirm that a cure will be found by season's end. Also, a shout-out to Sean Pertwee, whose Alfred has more to do here than he has all season. We are even gifted with the character's confrontation with Hugo Strange (B.D. Wong). Wong has only appeared sparingly this season, but he brings such weight to every moment he's onscreen. Here's hoping the show keeps him on speed dial going forward. 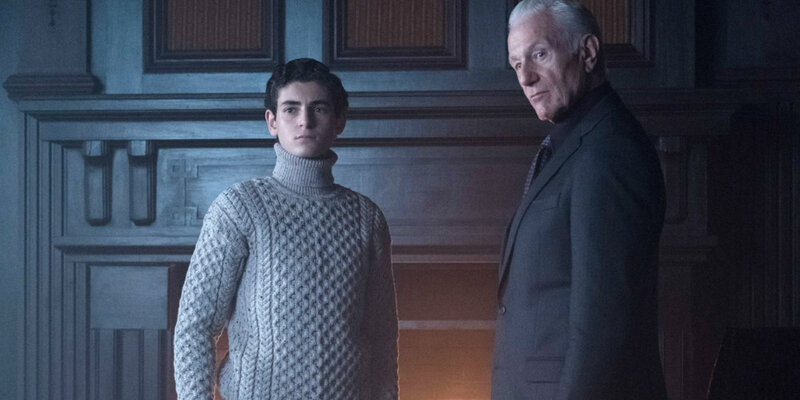 Apparently, emo Bruce is off dying in a corner somewhere, unless Gotham is planning some big twist next week. Instead, original recipe Bruce, aka zombie Bruce, is at the center of his own storyline this episode. After his mystical awakening, the future Dark Knight returns to Gotham (kinda) ready to unleash judgment on his hometown. Even though he still has no clue who these people really are, Bruce bought into letting his pain go so that he can fulfill his destiny, but longtime fans know this is all simply so that the League of Shadows/Assassins (any guesses which option the show will take?) can turn him into the ultimate weapon. Of course, that won't end well for Ra's al Ghul -- the "Demon's Head" Bruce learns about this week -- when all is said and done, though, it's easy to imagine that upcoming seasons will address Bruce's training. As much fun as it is to see Bruce moving closer to the cape and cowl, Gotham may run into trouble when it comes to jumping headfirst into this part of Bruce's storyline. After all, he's still a rather young teenage boy and presumably has a long way to go until he becomes Batman. However, if there's one thing we can count on the show to do, it's to toy with the source material (and viewer expectations) to deliver something completely off the wall. We'd be lying if we didn't admit we're intrigued to see what next season has in store for Bruce, even if his zombie state will probably wear off sooner rather than later. 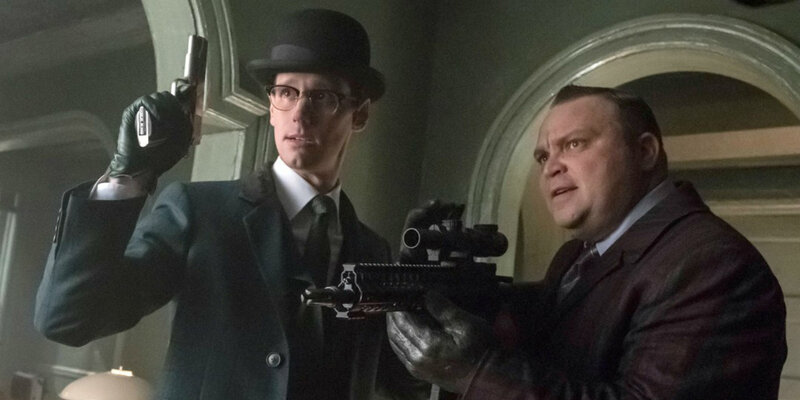 What does it say about Gotham that, even as a dangerous virus is poised to sweep the city, we're more interested in the Penguin/Riddler storyline? It probably just means that Taylor and Smith continued to prove why they're two of the best performers on the show, chewing the scenery with Violet Beauregarde-levels of determination. Whereas the GCPD are fighting the sinister organization that has been controlling Gotham, this more personal confrontation builds off of more than a season's worth of story between the two former besties. Unfortunately, before either can shed any blood, Fish Mooney (Jada Pinkett Smith) makes a surprising return. We've criticized this character in the past, and her out-of-nowhere appearance here was the very definition of a narrative deus ex machina. The show will probably chalk it up to Selina (Camren Bicondova) sending help, but we feel cheated out of a Penguin/Riddler sparring match. No weapons. Just one-liners. Meanwhile, the infighting between Tabitha (Jessica Lucas) and good ol' Barbara (Erin Richards) could mean that some major alliance-shifting is in the cards. Butch's (Drew Powell) off-handed line about how long they're going to tolerate this treatment feels like it has a plan behind it. No better time to unleash it than the season finale. Now that the end of season 3 is upon us, there's no telling how Gotham may shuffle the deck before year 4 comes rolling around. Gotham returns for the two-part season finale next Monday with ‘Destiny Calling’ and 'Heavydirtysoul' at 8pm on FOX.